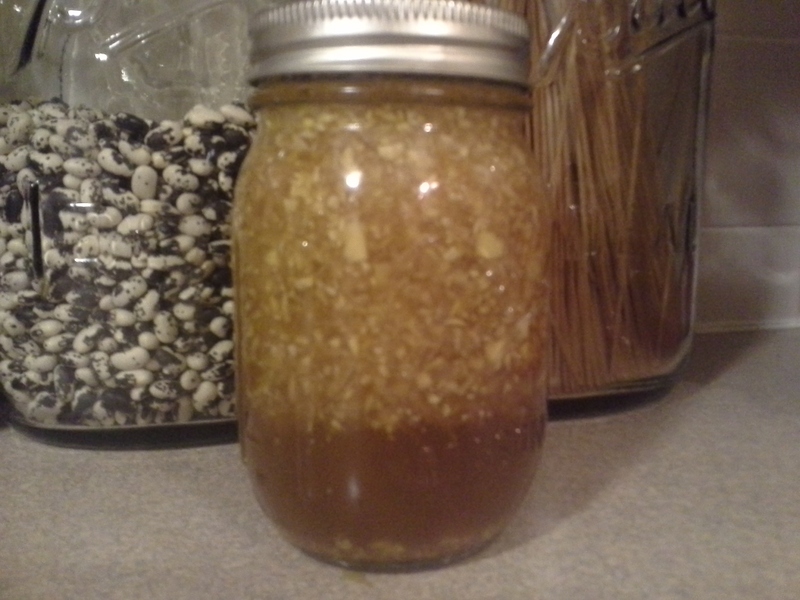 The honey shown is our raw honey from our backyard apiary. We have 3 warre hives. Heat honey on stove top until is is transparent or less viscous. (You will be able to tell when it’s right– it will easily swirl in the pan). Heat to 120 degrees OR LESS. (Use a culinary thermometer if you have one). Any temp higher than 120 will cook out the beneficial properties of the honey. Peel garlic, ginger and onion and pulverize in a food processor. If you don’t have one the old fashioned way works just fine. Add the mix to the honey pot and juice the whole lemon into the mix. Let the remedy steep for a few minutes before use. The healing honey can be used in teas or taken by the spoonful. I do not strain the mixture out of the honey. Once it is mixed into your tea it settles to the bottom of the cup anyway. (I know you’re sick, but don’t be a wuss). The honey mixture could be combined with extra honey lemon and hot water for a delicious and warming drink of its own. The remedy should be stored in the refrigerator since all of the inputs to the honey are fresh. With proper storage, the honey should keep through cold and flu season. I like the taste of the remedy, and was thinking about marinating salmon with it… But that’s just me, and I *might* be weird. Ingest daily for one week and at the first sign of illness. * Disclaimer* This information is in no way a substitute for your personal doctor’s orders. I am not an MD, an ND, nor am I a butcher, or baker, or candlestick maker. So there’s the facts. Take care of yourselves, and take care of one another. This is awesome. Thank you so much for the info. There has been so much hoopla about the flu, and I am doing my best to avoid it. I have heard that onions in your rooms help. I like this remedy because it combines a number of things. I will definitely try it out! I have heard about onion in your room also for flu. Here’s to hoping we never have to try it out! 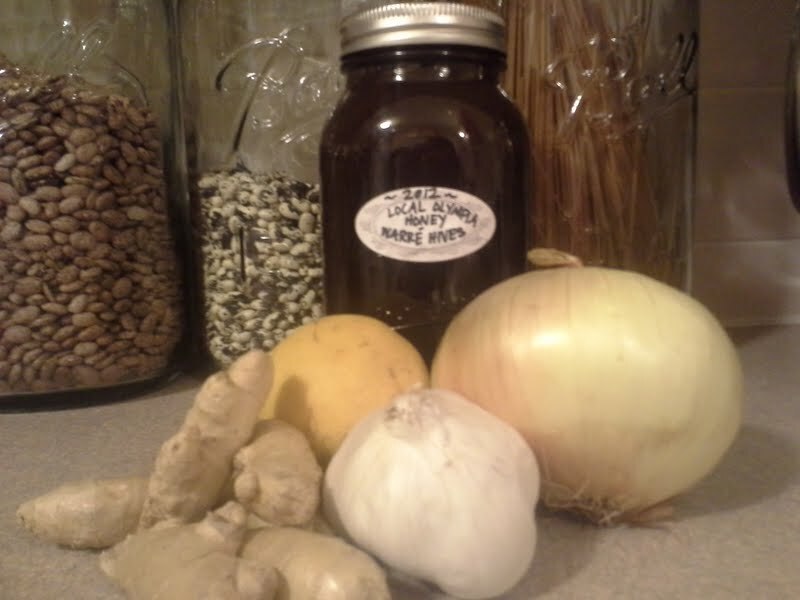 I have used honey and cinnamon together as a remedy but never onion and ginger. Do you take this prior to getting sick or duration?? I am taking this right now to clear up the last of my nasties. But it would make a great preventative as well! An all purpose remedy for sure! I think this honey remedy can really help me right now. Thanks! Here’s a fever tip called vinegar socks.. dip one pair of socks in mixture of warm water and vinegar, put damp on foot, then wrap foot with plastic bag, and place another really warm dry sock on top. Go to bed and in the morning your fever will have been pulled down and out your feet 🙂 Be well everyone! The honey mixture is delish, Suzanna! Thanks for the sock tip. We use a similar method here at home, without the vinegar, and with cold water. Sounds like an explorative blog post in the works! Be well, J. Awesome idea! And I would TOTES use this on salmon, that’s not weird, just delicious! I just recently read where honey and cinnamon have great health benefits and started making a paste on toast. Very tasty so, hope it works! Honey and cinnamon are a very old remedy. I’m sure it will work. Both of those foods have numerous healing properties. And, on toast! What a great idea! I hadn’t thought of that. Let’s add almond butter to the mix for a protein boost. I’m going to try that for breakfast tomorrow. 🙂 Thanks, Kim! I keep a mixture of honey and cinnamon to mix into my homemade yogurt. Tastes sooo good, and has to be healthy, too! Wonderful! I’m going to share your post on our FB page! We love us some natural remedies!!! Thanks for sharing on Wildcrafting Wednesday and The Creative HomeAcre Hop! Honey has many benefits, propolis from honey has many health benefits. I bet the honey makes this yummy 🙂 Thanks for sharing this on Wildcrafting Wednesday! I’m sorry to hear you’re under the weather! I am sure that honey remedy will help. Last time I had a terrible cold, I took that honey remedy, and also (tons!) of garlic pills, (Garlinase brand), Vit. A,C,E and Zinc blend by Carlson, and Emergen-C packets to bowel tolerance. Along with a bit of sleep, (I say bit because of the baby), the combination really helped me to get better! Good luck, and Namaste, Melissa. I’ve had a cold for a couple of days. I’m breastfeeding though and want to try to avoid drugs for baby’s sake and just because finding nursing friendly drugs is a pain in my rear. I just made this remedy tonight and really like how it tastes! I think I’ll end up snacking on this because I like it so much. Ha.) Thanks for posting. I’m sure it will help. Aw Tiff, I hope you get well soon! Being sick and being a mama should be illegal. 🙂 The remedy helps us, so I hope it is magical for you! I have been taking honey 1 table spoon, ginger powder 1/2 tsp, turmeric powder 1/1 tsp and 1 pcs of garlic last 15 years . I am not on any medicines, my weight is 128 stable. This drink should be taken in morning before breakfast and then you can take your breakfast, Your stomach will be smooth like a baby stomach. You will look young and even your age wont show on your face. Hi! Just found your site. Nice job! And I’m wondering if this honey mixture kicked the little buggy’s butts for you? Hard winter for viruses, for sure. Also wondering what adding ACV to this might taste like? I am a huge fan of ACV. It is my daily tonic. This mixture has been great this winter! I just took a bunch this afternoon because I felt allergies or sickness, and am feeling better already 🙂 I am not sure about adding ACV… Maybe take them separate? Or, make the remedy and see what you think about adding it. Good addition though. I too, LOVE ACV!